Gone are the days when you had a separate team for public relations (PR) and SEO, working in isolation. While your PR team was busy securing coverage in magazines, newspapers and TV channels, SEO was all about stuffing content with keywords. However, the recent times has seen a huge transformation in the digital landscape, and it is indeed time to switch gears. With over 4 billion people across the world using the internet, all the action has evidently moved online requiring brands to direct majority of their marketing efforts towards digital channels, thereby blurring the lines between PR, SEO and social media. That said, have you noticed how similar PR and SEO are? They are both concerned with content creation to build brand awareness and credibility. Not just that, both require building relationships and earn validation from third parties. 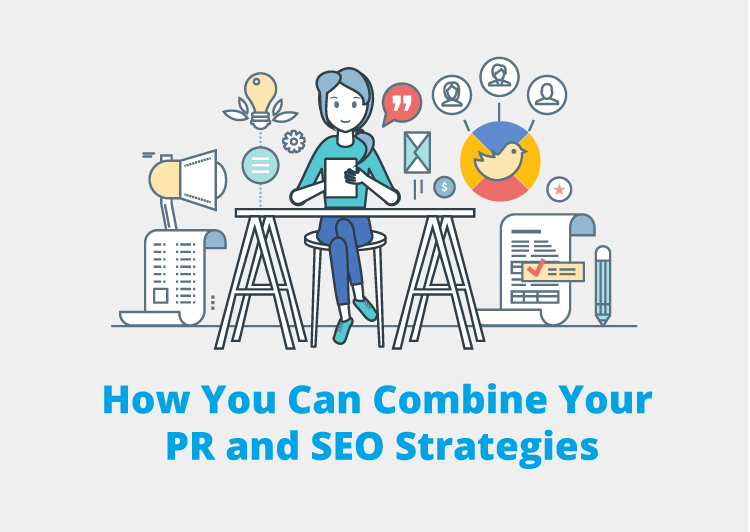 Given that the core of PR and SEO is similar, it makes absolute sense to combine your PR and SEO strategies to meet business goals, doesn’t it? Before starting any work, it helps to know who you want to direct your campaign to and create customer personas. Personas are fictional representations of your ideal target audience based on their demographics, personality traits, buying behaviors, challenges and motivations in life. A clear idea of a customer persona helps you create messaging that would directly speak to them. As both SEO and PR begin with understanding the target audience, it helps to combine the two research findings and create a unified persona for starters. While SEO makes use of audience research methods to understand the target audience, PR team does research on the publications, media outlets and influencers that the target audience engages with. We know how vital a role keywords play in SEO as optimising keywords marks the first step towards a successful SEO campaign but who said keywords should only be bound to SEO? It helps to share this list of target keywords with your PR team, so they can start incorporating them in PR material such as boiler platers, press releases, article pitches, FAQ dockets, interviews and more. The PR team can also curate stories around these keywords and pitch to publications. For instance, if you are a homebuilder brand, you can use the keyword ‘custom home designs’ on not just your website and blog but also on your press releases and media pitches such that it becomes synonymous with your brand across digital platforms. There is nothing more off-putting and confusing than a brand sending out mixed messages. While your PR and SEO teams have separate targets, they need to be aligned on the core messaging of the brand. Customers don’t differentiate between PR and SEO – for them, it is your brand speaking and it is important to give them the same brand experience across channels. So, whether a customer is browsing through your website or reading your CEO’s interview online, your brand needs to be true to what it stands for. How do you ensure this? Maintain a content calendar so that all the teams are on the same page and share content to meet each other’s targets. For instance, if your SEO team is writing a blog post, why not create an infographic out of it and have your PR team pitch it to relevant publications as well? No, press releases are not dead. They still serve as the official document for a company announcement and can work very well for your brand, provided they include SEO components too. Apart from incorporating target keywords in your press release, you should also consider including links to the brand website and other relevant pages. By doing this, when you earn media coverage, you also earn backlinks and are able to drive traffic to the brand website. This in turn helps boost SEO rankings. Remember – don’t just link to your homepage. It is important to drive traffic to more specified landing pages that can help generate leads or convert visitors. For example, you can include call-to-actions such as ‘contact us’ or ‘shop best prices’ and link to your contact page or product page respectively. Another huge similarity between PR and SEO is building relationships – be it with editors, influencers or bloggers. When PR professionals work on their media list, they must consider influencers who resonate with their brand and speak to a similar target audience too. After all, influencer marketing is at an all-time high and as per a study conducted by Collective Bias, 30% of consumers are more likely to purchase a product endorsed by a non-celebrity blogger than a celebrity. Working with influencers helps you meet your PR and SEO goals of creating brand awareness and getting high authority links by having them write about your brand on their website or blog. The idea is to work collaboratively towards a common goal, educate each other and most importantly, share information and results on a regular basis. By combining your PR and SEO efforts in this digital world, you are bound to maximise your marketing potential and meet your business goals better!